Most Mangaloreans are big lovers of Indo-Chinese food and so we usually stock up on condiments to help whip up a quick meal. However, let me tell you that we don’t really make super authentic Chinese or Indo-Chinese – at least our older generation of Mangaloreans didn’t know how to do that as recipes from that cuisine weren’t as freely available as they are today, thanks to the internet. Most recipes were handed down from one generation to the other or learnt from caterers who would offer a dish or two with a Chinese feel to it for parties or wedding. 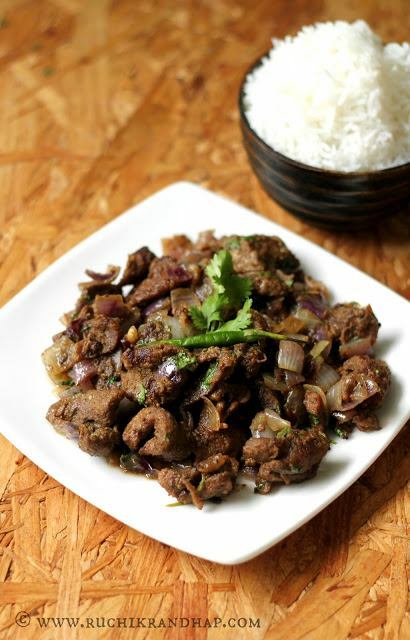 Most were fusion dishes – Mangalorean Indo-Chinese, with a liberal dose of Byadge chillies, cumin and what have you! Of course, the addition of soy sauce miraculously helped pardon all our sins and legitimatized the dish. 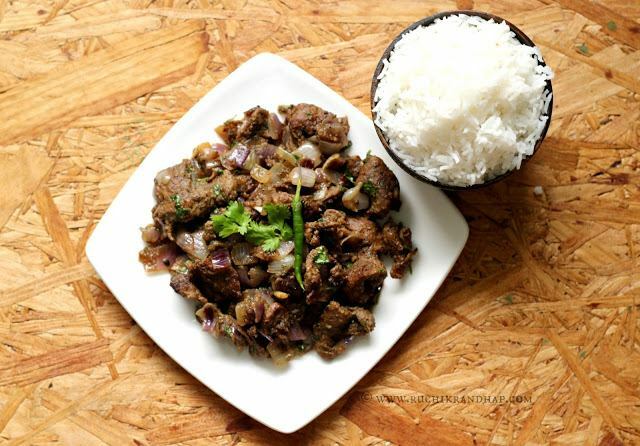 Most times we experimented with pork as we Mangalorean Catholics love this meat and don’t really have too many recipes to pick from. We don’t eat a lot of pork now and since my son is a fan of beef and mutton at the moment, I try out something new every now and then. I made this last week when Dubai was under the spell of rough and windy weather and so I didn’t get the best of pictures. However, the taste was such that it instantly brightened up the mood of everyone who ate it especially my neighbour who had dropped by to say hello. This recipe is pretty simple if you go by the list of ingredients and the method. There isn’t much of grinding to do if you use store bought ginger and garlic paste and use a mortar & pestle to powder up the roasted peppercorns & cumin. Paired with some Chicken Fried Rice the dish can add sparkle to your party menu. However, if you want to enjoy it for a simple weekday meal then just serve it up with some steaming hot plain rice. If you ask me, I love eating Indo-Chinese food with some dal and rice – I mix cuisines like that 🙂 Not a big food snob who goes by the rule book. For me its taste over logic, any day! So do try this dish and let me know how it works for you. Tell me what you served it with. Write to me at ruchikrandhap@gmail.com or drop me a comment on my Facebook or Instagram! Liked this recipe? 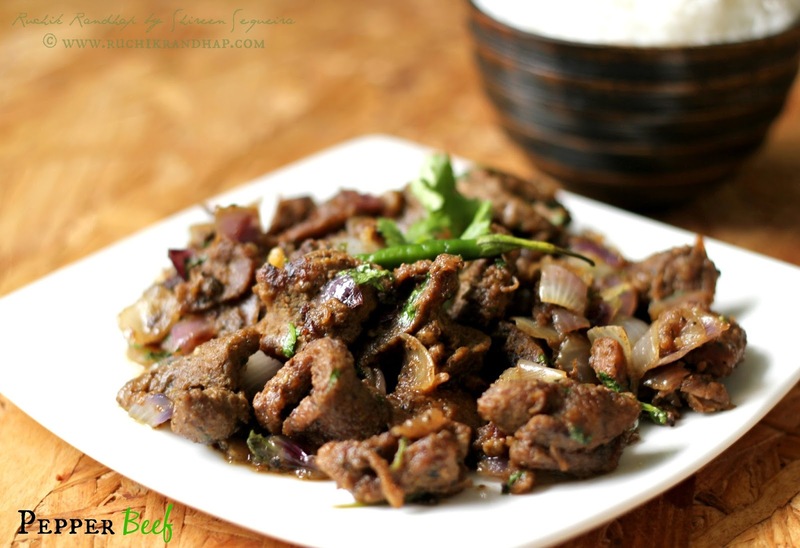 Have you tried some of these beef recipes? 1. Dry roast the peppercorns and the cumin one by one on a hot skillet/tawa. Remove, cool completely and then powder. Remove and keep aside. To the same grinding jar, add the ginger and garlic together till fine. 2. Wash and drain the meat well in a colander. Transfer to a bowl and add the pepper and cumin mixture, turmeric, salt & lime juice and marinate the meat well with it. Keep aside for at least 30 mins. 3. After 30 minutes, transfer the marinated meat to a pressure cooker, sprinkle some water (less than 1/2 cup) add the clove and cinnamon and cook on full heat till 1 whistle goes off. Reduce the heat to a sim and continue to cook for another 10-12 minutes (cooking time depends on the quality/tenderness of the meat so please use your judgement here). Remove the cooker from the heat and let it cool down to room temperature or till the whistle (weight) comes off easily. Stir to mix and keep aside. 4. 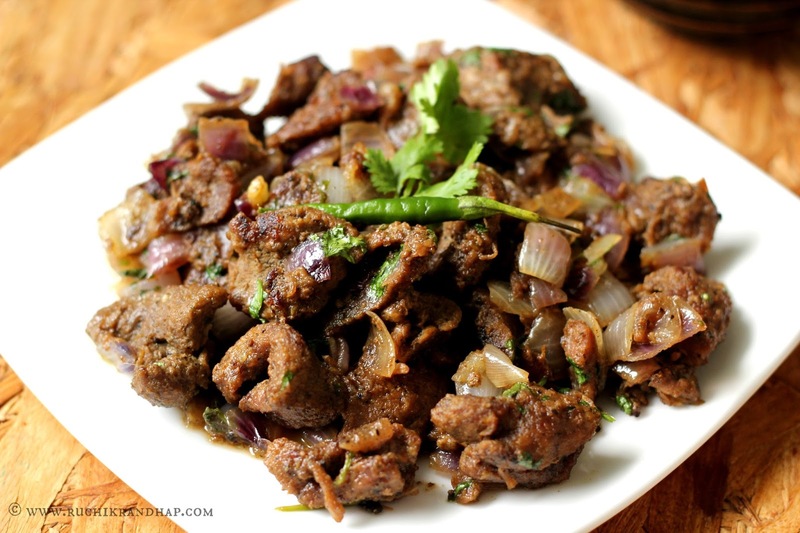 In a heavy, wide based wok/kadai heat the oil and fry the cooked meat in batches – do not overcrowd the pan or else the meat will steam-cook instead of frying. When lightly golden on both sides remove the meat and keep aside. 5. Add some more oil to the pan and fry the green chillies and onions till translucent (pale) and remove onto a plate. 7. Now, depending on how much stock (cooking liquor) you have in the pressure cooker you will continute to cook the meat – add it little by little and fry everything until the liquid evaporates. If you require gravy then retain some towards the end. Taste and adjust seasoning (soy sauce, vinegar, salt & pepper) accordingly if required. 8. Add the fried onions & green chillies back to the meat and give it a quick mix and cook on a high heat for 20-30 seconds. 9. Garnish with chopped coriander or spring onion greens, remove the pan from heat and serve hot with fried rice or plain rice. @ Vinit Deshpande: Thanks so much for sharing your lovely memory with us! @ Maria K: Thanks so much! Yes, you can alter the spice according to taste! Thanks for your feedback! Thanks for your feedback Sabina!! So glad that your kids loved it too! Sorry! My bad! You add it to the pressure cooker along with the marinated meat. The recipe has been updated now!